Harry Kane scored the equaliser on his return to action as Arsenal settled for a draw after taking the lead in the first half through a Kevin Wimmer own goal. 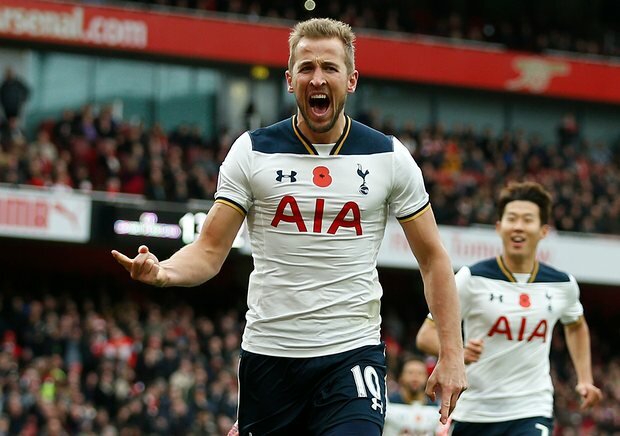 With the returning Harry Kane back in the side, Spurs were looking to build upon a strong start that has seen them go unbeaten in league football this season, while Arsenal were intent on capitalising on Manchester City's dropped points with a win that would see them reach the top of the Premier League table. Mauricio Pochettino fielded an experimental 3-5-2 system, opting to shut out the hosts with an extra man at the back with the threat of Son and Kane in attack to occupy both Arsenal centre-backs. 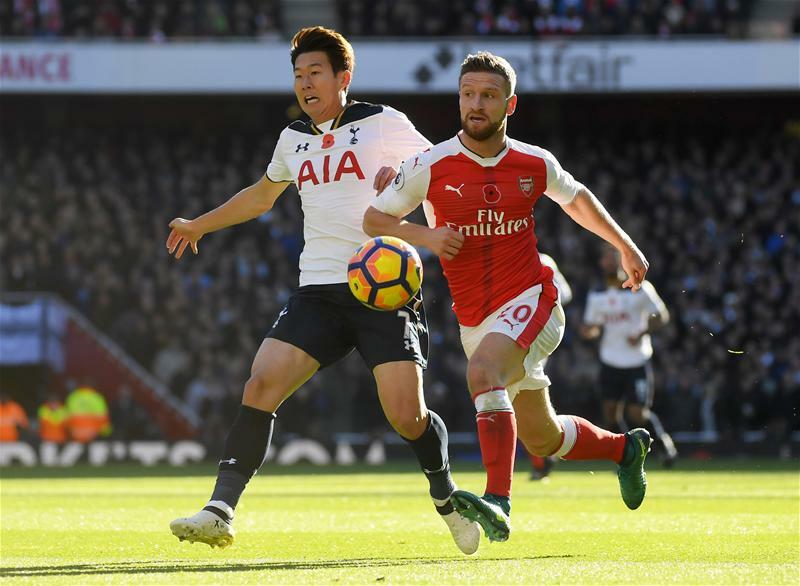 Initially, the approach worked as the Gunners struggled to adapt to the unique shape of their opponents, with Heung Min Son expertly spinning away from Mustafi to bomb forward, before threading the ball just inches too far from the reach of Harry Kane. Arsenal continued to naively play a high line, as Petr Cech was forced to rush off his line and clean up as the nerves jangled amongst the supporters. Spurs swarmed forward once more as Christian Eriksen floated an inviting low cross for Kane, but the returning striker showed his lack of match sharpness with a late run that ultimately missed the ball. As the half wore on, Arsenal began to show signs of life, increasing the intensity and focus in their game. A first real opportunity to open the scoring fell to the hosts, as Sanchez released Ozil down the left, before Iwobi eventually found himself in a shooting position. His finish was poor though, as Lloris gratefully collected his low scuffed effort. Theo Walcott then got in on the act, rocketing a first time effort off the post, before Ozil struck over from an awkward angle from the rebound. 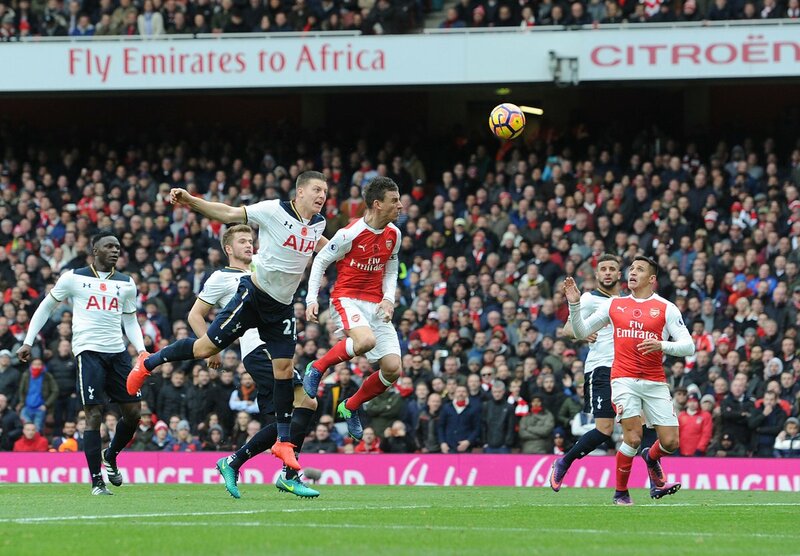 It took a stroke of luck for Arsenal to take the lead just before half time, as Ozil's whipped cross connected with Spurs defender Kevin Wimmer, who inadvertently knocked a header past his own goalkeeper under pressure from Sanchez and Koscielny in an aerial joust. Replays showed, however, the Arsenal pair were offside anyway, making Wimmer's mistake that much more costly. Coming back after the break, Spurs didn't dawdle in possession, forcing the issue to grab an equaliser from somewhere. A clumsy challenge from Koscielny on Dembele gifted the visitors a penalty, and Harry Kane duly accepted responsibility to tie the contest with a smashed spot kick straight down the middle of the goal. 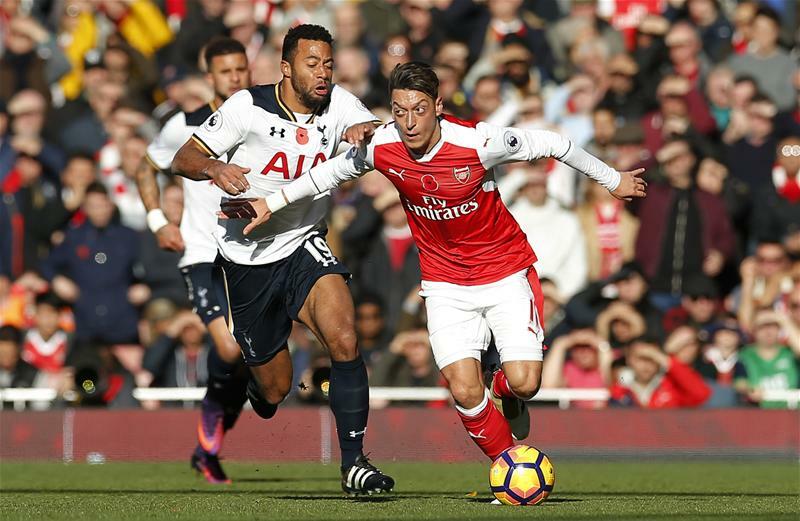 Looking like a rejuvenated side, Spurs were looking to take the lead as Arsenal cooled off in the final third. Eriksen stung the palms of Cech with a fierce effort from range, while Monreal was called into action to save his side on the hour. Danny Rose had stormed down the left flank and put the ball on a plate for Kane to rifle home, but the Spaniard threw his body in the way to deny a certain goal. Arsenal then went close, as Iwobi drifted a ball in for Xhaka, who had escaped the attentions of every Spurs defender, however the Swiss midfielder could not quite make contact with the ball as a hug chance went begging. Chances were coming at a premium as the game closed out, however Eriksen was a man on a mission, striking fear into Gunners' hearts with a free kick that rattled the post before Arsenal could clear. As the full time whistle blew, both sides will have felt that this was two points dropped rather than a point gained, especially considering the dropped points by key rivals in the race at the top of the table this weekend.